The Widows Sons, Masonic Riders Association is a group of Master Masons who have gathered together to promote Freemasonry within the motorcycling community and help introduce motorcycling to our non-riding Masonic brethren. As Freemasons we are committed to "Brotherly Love, Relief, and Truth" tenets of our lives, as Widows Sons we are devoted to supporting Widows and Orphans of our Masonic brethren. We hold events and rides as fundraisers for this noble cause, and other charitable causes. The chapters in Ohio are very diverse with members from various areas, lodges, and a variety of motorcycles. 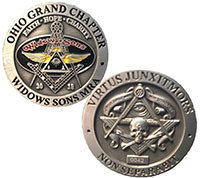 There are different levels of membership in the Ohio association, to accept non 'Master' masons, and also ladies 'companion' to involve our families in our two beloved interests. We are not an apendent body of freemasonry or the Grand Lodge of Ohio, and do not speak or act as representatives of freemasonry. We do however affiliate with other like-minded persons in the motorcycling community to positively demonstrate the fine principles of freemasonry. Who: All Chapter Presidents and/or representatives should attend!